The Trail and it’s stops really are a spectacle, however there are a few things that one should know about it. First off, while called the “Gringo Trail” it is by no means comprised entirely of Gringos (Americans), instead it is a Dutch and Swede heavy mix of Northern Europeans, Israelis, Aussies, and a good number of our friendly maple syrup loving neighbors from the north. Second, the profiles of these travelers are as diverse as the countries they come from – students, long-term travelers, lots of gap-year’rs, hippies, and a few retires. Four weeks supplied no shortage of people to surf with, travel with or have a beer with. Good times, without a question. 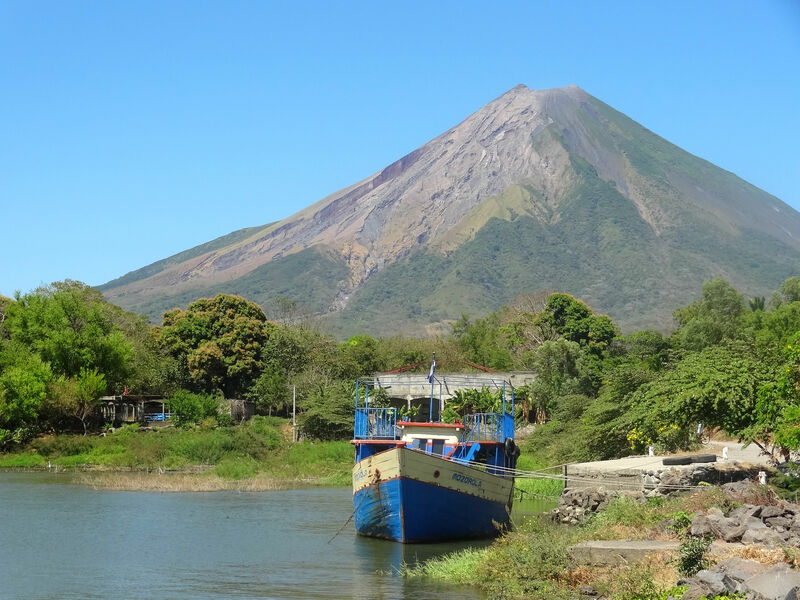 As the southern border of Nicaragua approached, we were ready for a change from the previous month’s beach town – colonial town – beach town – colonial town circuit, so we made moves toward Isla Ometepe – an island dominated by two volcanos and situated in the the middle of Lake Nicaragua. The island promised an opportunity to escape the crowds and hike into the clouds, so we packed up Beckey and shipped out. In preparation for the sail, Beckey was loaded down with 6 passengers then gently coaxed onto a ferry to the island. All in with gear and passengers she easily had 1,600 lbs on her shoulders, but she was a good sport. 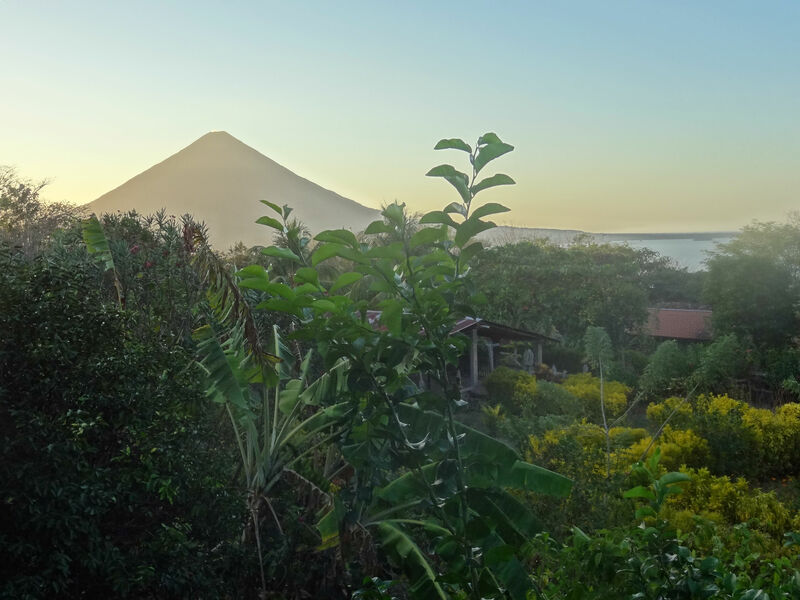 Upon arriving on Ometepe we were promptly informed that hiking to the summit of Volcán Concepción was not possible without soliciting a guide. Something about a French guy losing the trail, then losing an eye just a mere two weeks ago that caused the rule to be put in place. The whole story sounded a bit too fishy and convenient, so we decided to take a stab at it on our own. The following morning we rose early to beat the heat and made our way to the volcano at quarter past six. The hike proved to be straightforward – 5 miles and 4,500′ vertical. 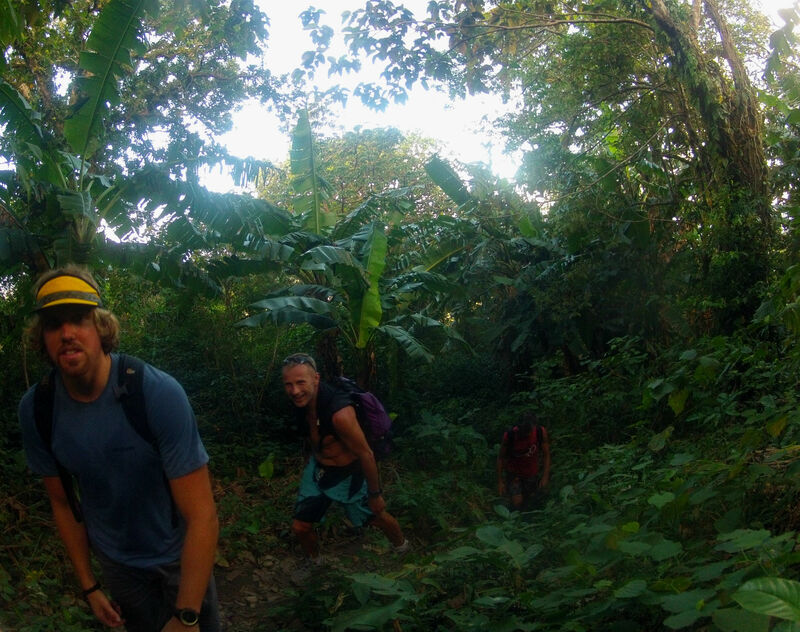 The trail was well defined, cutting through cattle occupied farmland, dense jungle and dried lava flows. The local guides were generous with their glares on the way up, well aware we had seen through their attempt at scaring hikers into using their services. Truth be told, using a guide may not be a bad idea for some hikers as the top 1,500′ did present a bit of exposure. Necessary? No. But maybe a good idea for some. We reached the summit within 3 and a half hours. At the top we were greeted by strong winds, wispy clouds and the strong but not overbearing scent of sulfur. To our dismay, the clouds did not clear during our time on the top, fortunately the photos taken a couple hundred feet below are just as expansive.The descent took nearly as long as the ascent due to the lose rock on the lava flows which we likened to walking on marbles. No one was interested in taking a spill and ripping up a knee on the way down, so caution was the name of the game. While no one in our group took any nasty falls, one hiker above tumbled a good 25′ down the 40 degree slope until Carson turned and put a shoulder in him to stop the fall. Another live saved, no big deal. By the time we arrived back at the vehicle it was peak heat. At this point our focus was directed toward hunting down cold beers and taking a swim, both of which would be accomplished within 30 minutes time. It’s tough to beat a post-hike swim, especially when the temperature is sitting north of 90 degrees. However, our memory of the swim has since been a bit tainted after learning Lake Nicaragua is home to fresh-water adapted bull sharks. I’m not joking here people, these notoriously aggressive creatures made their way up the river from the ocean into Lake Nicaragua and decided to set up shop. Doubt if you will, but it is clearly stated on Lake Nicaragua’s Wikipedia page, so I would pretty much bet my life on it. Upon returning to our place of lodging, a converted coffee plantation sitting at the base of the island’s smaller volcano, we chef-ed up a veggie-laden spaghetti feast to be shared amongst those staying with us. The Nicaraguan ‘Ron’ & Cokes and a healthy plate of spaghetti paired surprisingly well and were a great way to end the night. Tomorrow we would have to make our way back to mainland to take care of a few errands in preparation for our good friend Kevin’s pending arrival in Costa Rica. 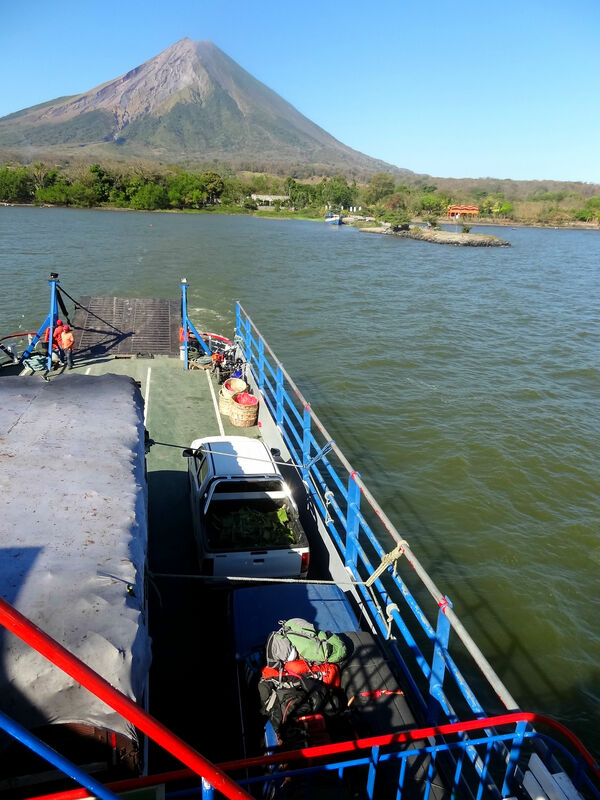 All of us agreed another night in Ometepe would have been welcome, but southward we must go! I always found guides were over rated in most of my adventures. As always there is a time a place where they might be needed. But not in something that you are doing in your everyday trek. Way to go guys on forging your way to the top and back to the beer and beach. That has always been a big draw after a good climb along with food.